The last Admission will be taken 1 hour before closing. 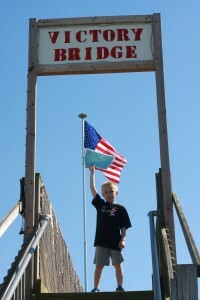 Patriot Days – September 14, 15, 16: Active Duty Military and Veterans admitted Free with proper ID. General Farm Admission: $9.00: Children under age 4 and under are free with a paying adult. Children age 12 and under must be accompanied by an adult. $2.00 additional charge to ride Tom’s Pumpkin Train for everyone over age 2. 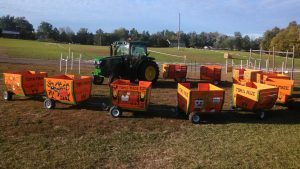 Tom’s Pumpkin Train Ride, pulled by a John Deere Tractor, is a family fun ride lasting approximately 10 minutes. The cost is $2 per person (children age 2 and under ride free) Adults are required to pay and ride with children age 10 and under. The Pumpkin Train will be running, (weather permitting) daylight hours only, Friday, 1- Dark, Saturday, 1- Dark and Sunday, 1-Dark. Train Ride Tokens may be purchased at the Ticket Booth or Concession Area. Tom’s Maze is only open weather permitting, If you question the weather in our area, please check the weather conditions on the front page, updates will be on our Facebook page, or call (937-866-2777) . Even if the weather is nice after a storm, ground conditions can force us to close. Unforeseen weather can force us to close at any time. Bring a flashlight to explore Tom’s Maze in the dark! Make plans early for your groups fall outing to Tom’s Maze so you won’t miss out on one of the most unique and fun outdoor activities in Southwestern Ohio! Not responsible for accidents or lost articles. – Sorry, no pets are allowed in Tom’s Maze regardless of size, shape, color or temperament. We know we just turned 21 but, No Alcohol Permitted. Located 1 mile west of State Route 4, at 4881 Germantown-Liberty Road at the intersection of Germantown-Liberty Rd. and Farmersville-West Carrollton Rd. Look for the signs! Join us for some good, clean, country fun!